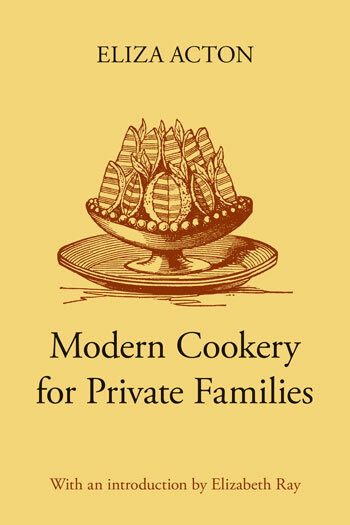 Modern Cookery for Private Families was first published in 1845. Eliza Acton expanded it ten years later, enlarging a number of sections and adding an interesting chapter on foreign and Jewish cookery. This reprint is of the expanded edition and includes all the splendid engravings of the original. Hers was one of the first cookery books specially written for the small household and she made sure that it was clear and easy to use. No one before her had thought of adding a list of ingredients, with the time taken to cook them, at the end of each recipe. Her instructions are always elegant, straightforward and concise. So anyone who wants to cook from it 175 years later will find that Modern Cookery for Private Families presents no problems. Here they will see the very best of English cookery untainted by the over-elaboration of late 19th-century taste. Creating simple dishes to perfection was her aim – and she succeeded admirably. Indeed, Eliza Acton’s cookery is very much in accord with present-day ideas about food: good ingredients, cooked to preserve their taste and texture and served at just the right temperature. Many of her recipes for preserving and cake-making are familiar today. The revival of interest in classic English cookery, already under way, will be much assisted by this unabridged reprint. An Introduction by Elizabeth Ray, who has made a special study of the author, adds some substance to Miss Acton’s shadowy personal life.